This. This! THIS is what #PieDayFriday is all about. 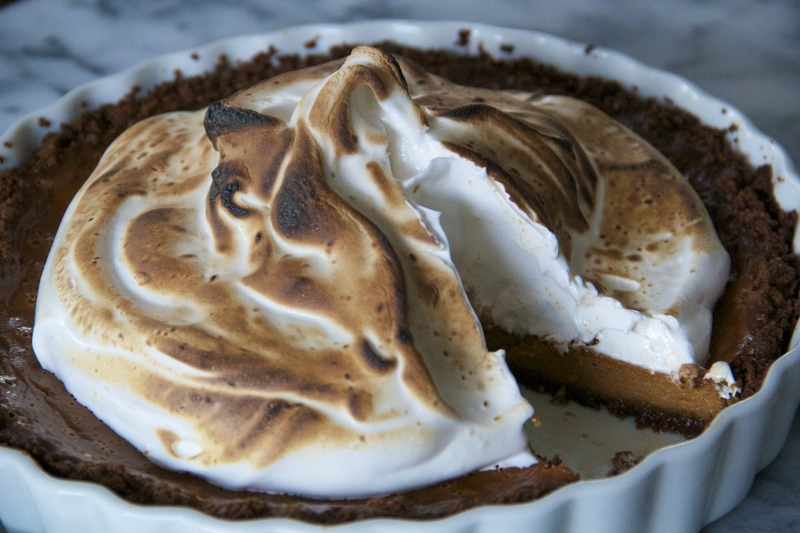 Custardy and sweetly-spiced sweet potato pie, tucked into a buttery gingersnap crust and topped with too much torched marshmallow meringue. I’ve always been a straight pumpkin pie kind of girl (side of whip), but I figure I’m 30 now, and it’s high time to give the sweet potato a chance. Turns out it’s a seamless transition. Subbing sweet potato for pumpkin in pie isn’t an earth-shaking departure, flavor-wise (our familiar pumpkin pie spices are ever present), but I know some people have strong opinions about the merits and downfalls of each. Personally, I am not one of those people. I’ve actually heard that the best method for this kind of pie is to use butternut squash. Maybe next time I’ll try to distinguish this pie as SWEET POTATO by subbing out some of the traditional pumpkin pie spices, or adding a drop of molasses, or using heavy cream instead of evaporated milk? Or maybe I’ll just keep it exactly as it is. Extra marshmallow, always. You can totally make this pie a day or two ahead of time – just be sure to leave off the marshmallow topping until an hour or so before serving (it’ll wilt a bit in the fridge and leave the pie soggy if left to sit too long). And feel free to substitute pumpkin or butternut squash for the sweet potato in the filling. …Also, the Jet-Puffed Marshmallow Creme (yes, the “e” at the end is totally necessary)? Just go with it. 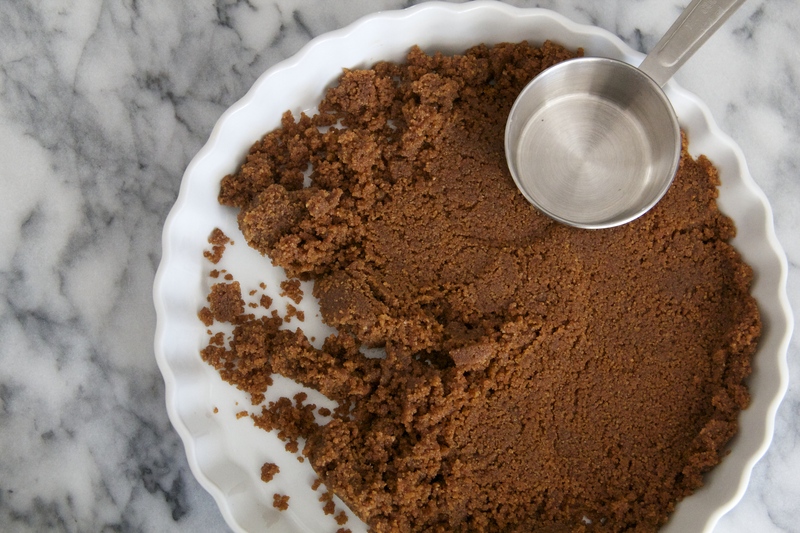 Place gingersnaps in the bowl of a food processor, and process until just fine crumbs remain. Add the melted butter and pulse until incorporated (the crumbs should feel moist and clump together). 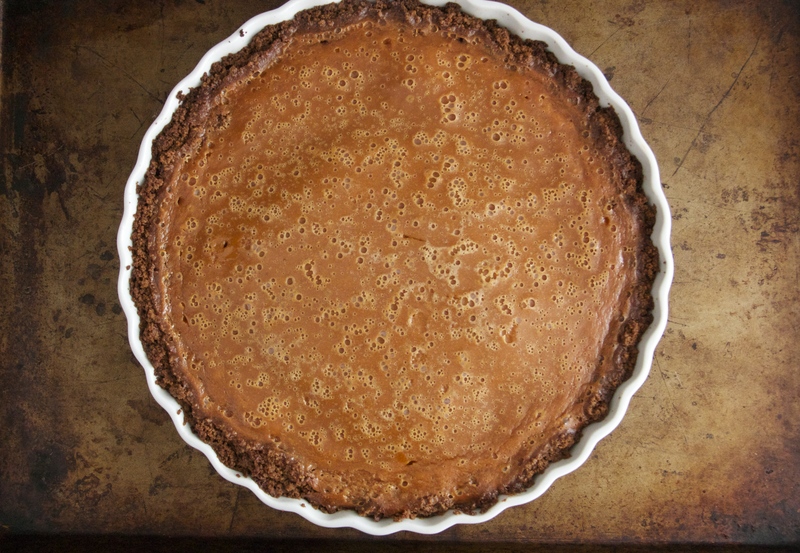 Press the gingersnap crumbs into the bottom (and up the sids) of a 9-inch pie dish. Bake the crust until set and beginning to brown, about 10 minutes. Set aside to cool slightly, and increase the oven temperature to 425 degrees F.
Mix up the filling: in a small bowl, whisk together the sugar, cinnamon, salt, ginger and nutmeg. In a larger bowl, whisk the eggs and sweet potato until smooth. Add the evaporated milk, and whisk until combined. Finally, add the sugar mixture, whisking to incorporate smoothly. Pour the filling into the pre-baked crust, and carefully transfer the pie to the oven. Bake the pie at 425 degrees for 15 minutes, then lower the heat to 350 degrees and bake for an additional 40-45 minutes, until filling jiggles only slightly and a knife inserted into the center of the pie comes out clean. 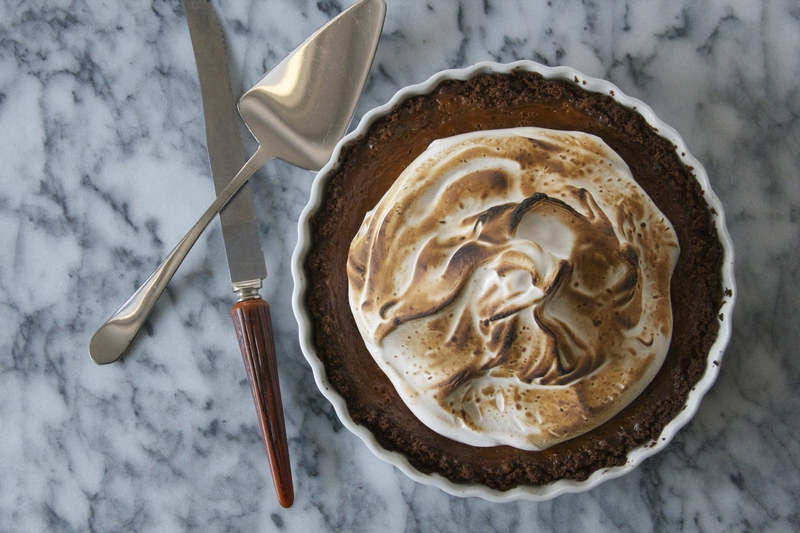 Allow pie to cool completely (note: at this point, the pie can be stored for a day or two in the refrigerator – top with marshmallow meringue and torch just before serving). To make the topping, whisk the egg whites and salt together on low speed of an electric mixer until frothy. With the mixer at medium speed, slowly add the sugar, 1 tablespoon at a time, until the egg whites have turned to meringue, and hold stiff and glossy peaks. Add the marshmallow creme to the meringue, and whisk in until smooth. 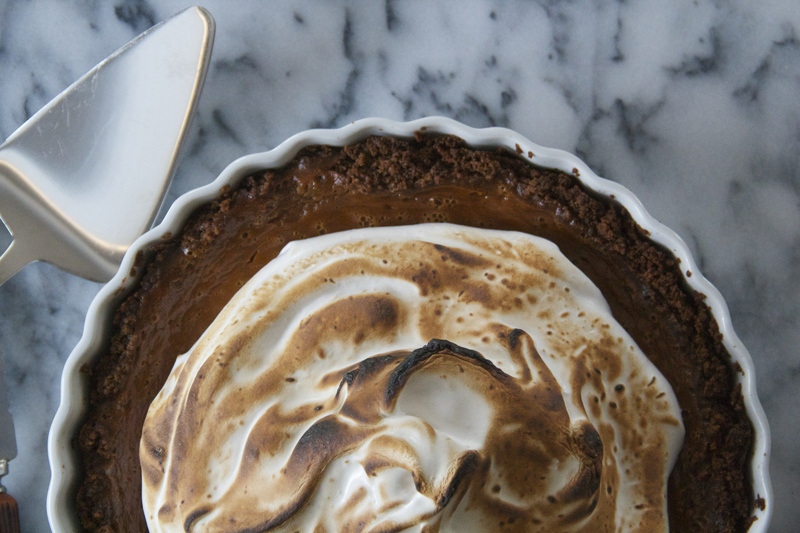 Top the pie with the marshmallow meringue, mounding it in pretty waves, and then either use a kitchen blow-torch to brown the marshmallow topping, or bake at 400 degrees until lightly browned, about 4 minutes. Place pie into the refrigerator until ready to eat (allow to sit at room temperature for about 20 minutes before serving). This pie is my dream pie. Just perfection! Oh my god. This looks life changing. Can we add to the menu this year? This is so so gorgeous! I just made my first sweet potato pie the other day–it felt like such a feat! I only regret that I didn’t have the foresight to whip up a meringue for the top–definitely doing this next time!! !